The QuickBooks Online .NET SDK makes it easier for .NET developers to create apps for the QuickBooks Online APIs. This page describes how to create your integration, including features you will most likely want in your app. The QuickBooks Online .NET SDK makes it easy to integrate your .NET web app with the QuickBooks Online API. This guide assumes that you have an existing web app that you want to integrate with QuickBooks Online. You should have basic knowledge of ASP.NET MVC Framework. This step can be skipped if you are running the Hello, World! sample app. To verify installation of the .NET SDK, go to the Visual Studio Solution Explorer and note the Intuit.Ipp entries under References—for example, Intuit.Ipp.DataService. Skip to the next section if you have already created an app in the developer portal. 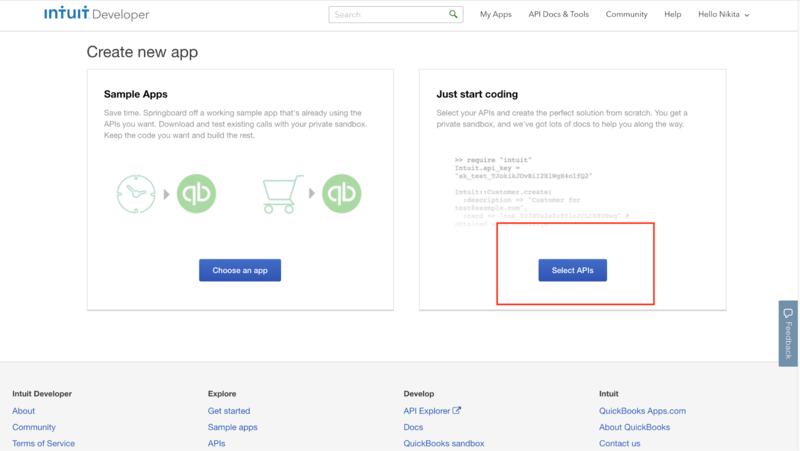 To connect your app to a QuickBooks company, you need to create an app on the Intuit developer portal. Sign into the developer portal and click on My Apps. Click on Create new app. On the Create new app page, click Select APIs under Just start coding. Select Accounting and click Create app. Creating a developer account also creates a QuickBooks test company (also referred to as a sandbox company). You can create up to 5 sandbox companies. You will use your sandbox company in the following steps to become familiar with the authorization flow. This authorization flow requires the client ID and client secret from your app’s Keys tab. During the authorization flow, your app is redirected to an Intuit server to get the authorization code after validating the user’s username and password. This authorization code is sent to the redirect URI that you specify in your app’s Keys tab as shown. For the Hello, World! sample app, the redirect URI is http://localhost:27353/callback. Configure the client ID, client secret, app environment (sandbox or production) along with the redirect URI in the <appSettings> section of your Web.config file as shown here. To view a complete web.config file, go here. Instantiate OAuth2Client object with clientId, clientsecret, redirectUrl and environment. Using this object, generate the authorization URL to get the OAuth2 aithorization code by specifying required scopes. The following example shows how to generate the authorization URL. To see a complete code example, go here. 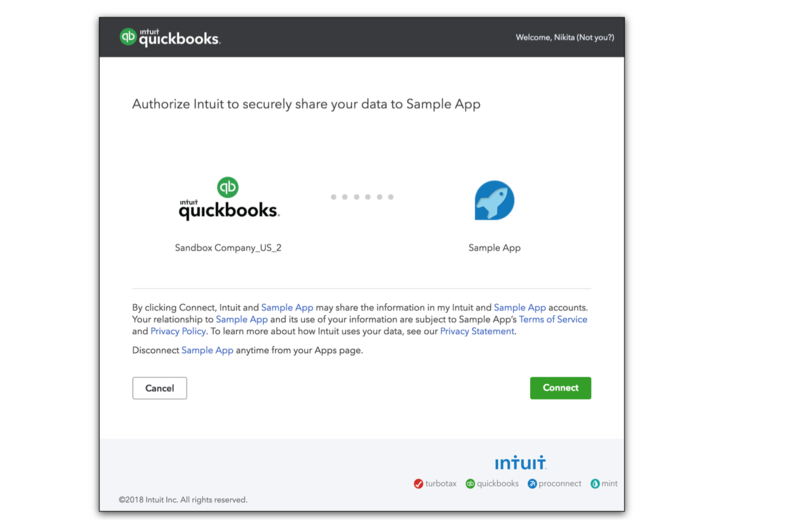 The authorizeUrl shows Intuit’s consent window meant for the QBO user to connect to the app. After they click the Connect button, the request is sent to an Intuit server. When successful, Intuit responds with an authorization code and QuickBooks Company ID (also called Realm ID) on the redirect URI. Use GetBearerTokenAsync method of OAuth2Client class to get OAuth2 tokens and expiry details as shown below. For the complete code example, go here. 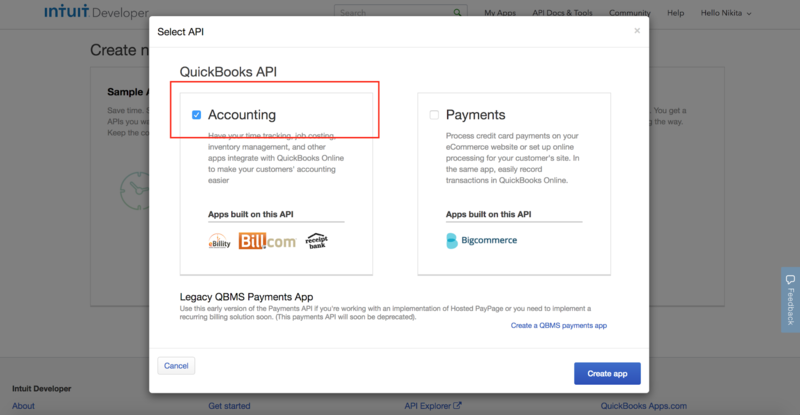 Once the tokens are received, they can be used to make QuickBooks Online API calls. First, create a ServiceContext object. A ServiceContext object is created with an access token along with the RealmId and works as a context for the API request. This ServiceContext object is then used in QueryService to query for CompanyInfo data. QueryService can be used to execute any QuickBooks Online API supported query as a String in the parameter as shown below. Go here for a complete example.